Recent news of Kushner Companies’ filing of false documents outlining the residential makeup of their buildings in order to get construction permits has prompted a closer look at the practice, which, according to Politico, has been rampant among New York City property owners for years with few consequences. Last month the Department of Buildings fined Kushner Companies $210,000 for repeatedly submitting inaccurate paperwork. Tenant advocacy group Housing Rights Initiative (HRI) will release a report Monday outlining how landlords filed more than 10,000 deceptive PW1s (Plan/Work Applications) in the span of two and a half years. Kushner Companies, run by the family of Donald Trump’s son-in-law Jared Kushner, allegedly falsified construction permits as a way to remove rent-regulated tenants from their New York City buildings, the New York Times reported. 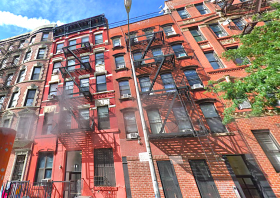 The city’s Department of Buildings on Monday fined the Kushner Cos. $210,000 for 42 violations of submitting false applications across 17 buildings. According to a tenant activist organization, Michael Cohen, Trump’s former attorney, also falsified documents at three of his properties in Manhattan at 237 Henry Street, 172 Rivington Street and 235 East 27th Street. 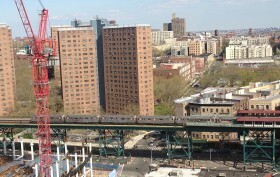 New York City’s construction craze just got easier to track, thanks to a new tool that maps every major, active project across the five boroughs. 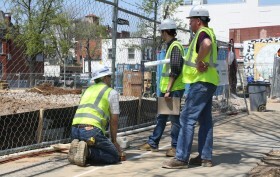 The city’s Department of Buildings released this week an interactive map and dashboard that provides real-time information on every active construction site in the city. According to the data, there are currently 7,437 active permits filed and nearly 198,000,00 total square feet of construction, as of Wednesday. As of this week, New York City is home to 7,342 sidewalk sheds, totaling nearly 270 miles of sprawling eye-sores. Although this may sound like a lot, the number of sidewalk sheds has actually decreased from last year, when the Department of Buildings found over 7,700 sidewalk sheds throughout the city. The DOB on Wednesday released a new map highlighting the exact location of permitted sidewalk sheds. The map, which will update automatically in real-time, has a new feature that allows users to search sidewalk sheds by age, borough, community board and permit applicant. To give workers a comfortable and conducive work space, some companies have outfitted their offices with amenities like on-site fitness centers, free coffee and outdoor space. However, the city’s Department of Buildings has launched a campaign to stop or delay these rooftop terraces on office towers, claiming the spaces can only be used for plants, not people. 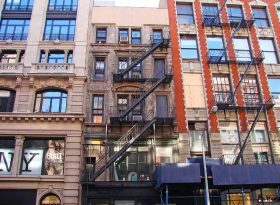 As the New York Post reported, DOB may not approve office terrace plans and may even rescind already approved plans. In early 2014, the Department of Buildings (DOB) set up a permanent audit unit and started reviewing the architectural plans for thousands of new and renovated buildings. What they’ve found is alarming; nine out of every ten office and/or residential buildings failed to meet the New York City Energy Conservation Code (NYCECC). The energy standards were implemented over 30 years ago, but are just now being enforced. And while environmentalists welcome the stricter monitoring, some building owners and construction companies are nervous about the potential increased costs of compliance, both in terms of money and time.